It seems that Madness have found themselves again in the guise of The Dangermen. Seemingly they've gone back to their roots and are wowing the back rooms of pubs across the land (well, the Dublin Castle) with Prince Buster era bluebeat and ska. I got You Are The Quarry at last yesterday and really like it (what eventually encouraged me into this purchase was my Dad telling me about a dreadful record he'd heard on Radio 2 by Mozzer about a home for the blind... how could I resist). In fact it's refreshingly good. As is the Charlotte Hatherley record Grey Will Fade. I recommend. 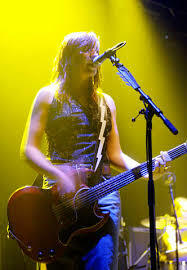 In the meantime, lt's hear it for the erstwhile 'Donna Tartt of Pop', Juliana Hatfield.